The chapter begins with a review of the general principles of atmospheric motion including scale analysis of tropical motions. An overview of the general circulation of the atmosphere and ocean is presented including stratospheric general circulation. Special emphasis is given to the Hadley circulation including its maintenance, seasonal migration, northern and southern hemispheric differences, and the contrast between tropical and midlatitude wind systems. Tropical circulations are examined in a theoretical framework as responses to heating at the equator. 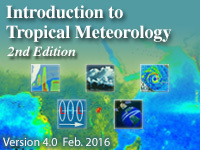 Regional monsoons, their conceptual models, seasonal evolution, and variability are explored. Modeling of the general circulation is examined in a focus section. Very good at explaining global circulations, but outside resources were necessary to understand some concepts. This module takes much, much longer than suggested. I learned a lot of new information, but not sure how much was fully understood. 5-8 hours would be a more realistic time estimate. A great deal of physics/upper level math. Understand and describe the similarities and differences between atmospheric motions in the tropics versus the midlatitudes.